Marschall Groom Cellars is a very small family winery situated in the famous Barossa Valley region of South Australia. The winery produces three varietals, Sauvignon Blanc, Shiraz & Zinfandel - under the label GROOM. Marschall Groom Cellars is the culmination of a dream, backed up by many years of talk and family discussion. 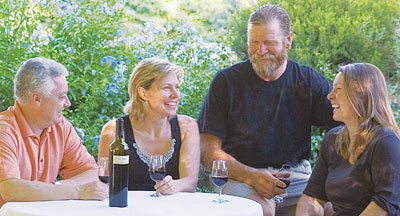 The proprietors are Daryl & Lisa Groom and their four children, and David & Jeanette Marschall and their six children. Sadly David succumbed to an aggressive brain tumor in April 2013. The dream started to become reality with the purchase of 87 acres of bare land in the Kalimna appellation of the Barossa Valley, directly adjacent to the renowned Penfolds Kalimna vineyard - the home of Grange. In 1997 we planted our first shiraz vines all planted on their own roots. The Barossa Valley is too warm to grow world class Sauvignon Blanc. This variety is ideally suited to much cooler, higher rainfall climates. After thoroughly researching the climatic conditions within South Australia, a 20 acre vineyard in the Adelaide Hills appellation of Lenswood was planted to provide the perfect grapes for our Sauvignon Blanc. In 2000, 8 acres of experimental Zinfandel vines were planted on the Kalimna Bush Block. A very limited introductory wine release from these grapes was made from the 2003 vintage. The first Commercial release into the USA was the 2006 vintage. Our desire for the GROOM label is to let the vineyards and their fruit do the talking in producing the style and quality of our wines. As proprietors, we have set the foundation in choosing the most ideal viticultural region needed to produce the highest quality for each of our chosen varieties. ENJOY! This majestic style presents a cascade of cherry, raspberry, black cherry and spice flavors, balanced on broad-shouldered but sleek frame.